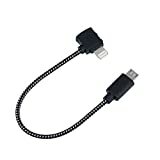 · Length: 5.9 inch (15 cm) Smart Phone Cable, 11.4 inch (29 cm) Tablet PC Cable Colour: black. · Fits cell phones and iOS / Android system tablets with different cable lengths and plug option. · Fully compatible with iOS 10, iOS9, iOS8, Compatible with iPhone 7 / Plus, iPhone 5 / 5s / 5c, iPhone 6 / 6s / plus, iPhone SE, iPad. · Note: For Apple device users, if it shows unsupported accessory, please disable your WiFi device, connect the cable and enter the DJI GO4 App and will connect with RC successfully.